Do you have a hard time remembering what you read? Do you need to read things many times before you understand? Reading books can be discouraging because of the large amount of information on each page. To help you make sense of all that information, I will show you how to create a mind map. A mind map is a graphic that shows categories containing quick reference points from your book. By taking short notes and organizing them in a specific way, you will have all the information you need to quickly and easily remember the important points of a book. Just the process of thinking about and creating this mind map will help your brain to understand and remember the material. Try it! It really works and it is free. Mind maps are especially useful when it’s time to write an assignment or study for an exam! Watch the video to learn how to create your own mind map. Reading is difficult if you don't understand _________ of the vocabulary. Mind maps are useful because they force you to ____________. This makes things easier to understand. In a good mind map, all the information ______________. Why are there pictures in a mind map? To help understand and remember the vocabulary, use your dictionary to find ___________. Most books are organized by _________. A _________ helps you remember what happened and when. In your mind map, it's a good idea to include the type of book, ____________, and the date of publication. Hi, teacher! I am very greatful for EngVid, it has great teachers and you are definitely one of them! Let me tell you that I have found out that learning for me is easier when I listen to someone else, for some reason reading makes me very tired, I wish this didn´t happen to me since reading is very good; don´t get me wrong, though, I do read but I´m saying that it is better for me to listen to someone else instead of reading on my own, like you guys or audio books. Anyway, like I said I am very greatful and you are a great teacher and this was a great lesson! Hello my friends. Kotoz wasn’t the first one because of me. He gave me way by sending me the notification about new lesson on Skype. But I was buzy with my work, so his generosity was in vain. Anyway thank you, Kotoz. You are the real gentleman. Thank James for the lesson. I always take notes on the lessons; it’s very useful. But tell you the truth, l have never read books in English! Many years ago I tried to, but it seemed to me too difficult, so I quitted. I will take the new attempt; and will definitely use mind maps. Thank you, James , for encouraging us! Hello Nataanna and SKIKDA. Both friends. First, I need to congratulate SKIKDA for his/her kind heart. Well_done SKIKDA. Now I’m sure you’re the real first one and Winer. Keep it up. Believe me, I didn’t mean it. Don’t be upset with me. If I wrote sth that made you upset, I beg pardon. Second, I like to tell you Nataanna; that try reading english books, they are really useful and effective for your speaking skill. Read an english book as soon as you can. Why do you call Kotoz as SKIKDA? Wow! This is a very clear explanation, thanks for your tips, James. By the way, before this video I didn’t know the meaning of the word “mutt”. Hi Canardo! Me neither. I used the word “tyke” instead of mutt. I didn’t know mutt neither tyke but according to my dictionary mutt is slang word for dog and tyke is for young boy or michievous child . Are you sure we can use ” tyke” speaking about a dog ? I was sure that “tyke” meant dog without any breed before your comment…. Then I made some research and found out that it would be better to say “mongrel” or “cur”. But “cur” is the dog whose parents are of different breeds that is frightening or fierce. Although some Russian dictionaries translate dog of mixed type as “tyke”. Does anybody know the proper word? Help ….I Need help ….Why my firefox don’t load this site? …I’m Coming by google chrom already . Hello teacher! It’s a real pleasure for me to watch your videos. They are very usefuls, it’s been a while since i wanted to find a good way to improve my english. But now i think it’s Alright due to your help. I am gonna keep Watching your videos. Thank you very much teacher! Hello, start with taking notes of each lesson. It will help. Good luck. Hi, James thank you for today´s lesson great. Thank you, engVid is one of the best way for learning English. who can tell me how to turn on engvid video ? Hi! It looks like you’re posting from China, where YouTube is blocked. You’ll have to use a VPN to see the videos. I find this lesson helpful. Hi, James. Thank you for posting the lesson. I would like to ask you for providing subtitles English for downloading, belive, it really helps very much. Provided subtitles as yours videos already has are importante as well but for learners the other way put together with this one will be more powerfull. Please,lets all teachers from Engvid know the suggestion. Sincerily. There currently isn’t a way to download YouTube subtitles separately. 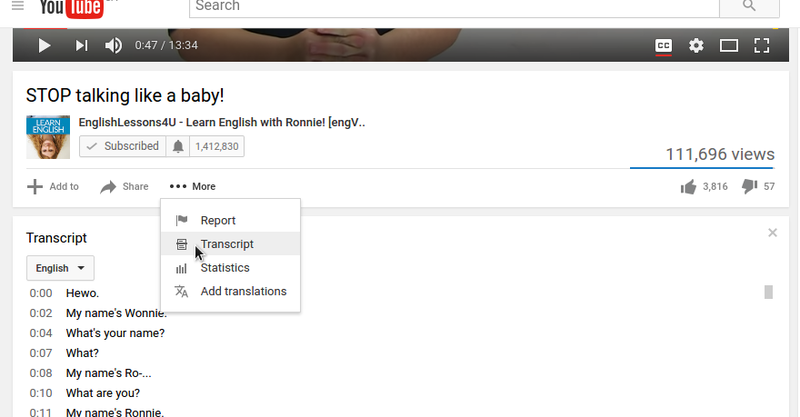 However, you can see the whole transcript by going to the video on YouTube and choosing “Transcript” from the “More” menu – here’s a picture. Could you recommend me any book for intermediate level? Following this lesson, I almost fall sleeping because I have listened to other videos that “Valery teacher” has sent me by Skype this evening and I have had with him a video conference, to interchange comments that I have had to keep in mind with Mental Maps to explain to him because I have almost spoken during 20 minutes, I am exhausted now with all the evening listening other histories. Very useful to identify a word or concept with a picture, and requesting all the background of a book to get a general idea of it. I have doubted with the timeline concept but I had thought that it was the correct answer though I selected another answer, and the assignment when you have read a book to enquiry its ideas and comments. Thanks a lot, teacher James, it has been a good explanation how to make Mind Maps. Yes, I have to practice writing and speaking, but always with mistakes, I can’t avoid my mistakes. Thanks! James thanks for your lesson !!! you are great!!! Thanks teacher, just one feedback keep aside of the board, your body is blocking the board (This is a class, not a comic show presentation where you stand in the middle); I like student like to take notes, save screens, look back previous notes you write, should be a column not two or smallers and you should take the right side or left. Hi teacher, thank you for this lesson. My main problem when I’m readidng is that I don’t know many words/exprexions/slangs and the process is too slow. I have to review the dictionary many times to understand the general idea. At the end, I take many time understanding and jus get me more stress. Can you help me? Hi James. Very interesting! I’m glad I’ve made only one mistake on the quiz (I got 9 correct out of 10). That means, your lesson was NOT all Greek to me. Thank you very much. See you in your next video lesson. Bye! I got 90.Tx Mr James. U learn me a lot of things. I hope to see U soon!?! Hello mgh. How are you? First; happy NOROUZ. Have a nice year. You know, I just want to remind you that you have to say ;”you TEACH me a lot of things. ” Not learn me. Actually,we learn from James, but he teaches us. Did you understand? I hope you can understand my words. See you again my countryman. Really nice lesson, this will help me to show my Ss the importance of reading and using mind maps as tools for understanding. Thank you. D.T. looks like real one! hello teache.Thankyou for lesson.I got 6 coorrect out of 10 from quiz. Mr. James you are ma’ favorite teacher and you teach well. I am a new comer for engvid.com. but I don’t know how to use it after logging in. Who can help me? I will appreciate that. Hi. It´s awesome!! you helped me a lot. Thanks!! You did really good. But it is little confusing. I want you teacher to show us how to read fast and understand what you read to answer the questions that belongs to an essay e.g. Kindly I hope if I can arrange some lessons with you but I do not know how can I reach you. please advise. I find your every lessons very helpful. Got 10-10. Thank you James. I will try mind map on the novel that I am reading. I never know about this before thank you for the lesson. THANK YOU SO MUCH JAMES. IT IS VERY USEFUL FOR ME STUDY ENGLISH AND EVERYTHING. hello dear sir. May I have the pdf source of that lecture? Thanks James, very interesting and useful lesson, love it. I’ve got 8 correct out of 10. Great James . Do you have Skype ? Could we talk once or twice a week to improve my conversation ? Of course I would pay for that … Thanks !!! Great takeaway Mr. James. I’m really grateful for this lesson. I read one of my classmates comments, she and I have the same way of learning. I’d rather watch, listen and absorb rather than reading. I would highly appreciate your suggestions. It is Easy To Remember the subjects this way Thank you . Nice lesson, James! You’re one of my favourite Engvid teachers. Greetings from Brazil! I am glad to find ur courses. James, I really love your style of teaching! Thank you. Mr James. That’s a great lesson. Thank you James, I’ve recently started following your lessons and I’m learning a lot. This EngVid is great! Thank you so much!!!! Great lesson, very useful!!! Mr. James, you make learning a breeze! Thanks. Wonderful video, James! Thank you for help me to improve my reading and comprehension!! That is an awesome video!!! Thank you for such a good information I will keep it mind! Thank you James and Mr. E. See you! I like it, congratulations! you have a gift to teaching. thank you so much. But how to improve my reading skill,and speed? Hi all of you my friends ,l’m realy jubilant and l want to continue but my internet is running out , but l will come back at other time , l love it so much and thank you for all of the vedio and l got punch of information to day and l hope to get more and more later have anice day . Hello sir , can u tell me that how can I use this in case study for any exam ? Mr. James, you are the best!!! I have enjoyed your videos and will be using several in my classroom. Do you have any lesson on opinion writing? Thank you so much James!! This is really helpful and easy to understand. I personally appreciate the way you deliver your lesson. this section is particularly interesting. However too short to undertake you are teaching us. So, would mind if you show us how to develop reading skills?